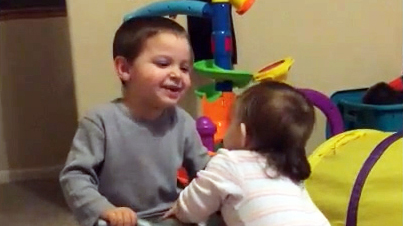 Adorable little boy gives his baby sister some encouragement, on The Feed! Some of the latest and greatest viral videos include a big brother emboldening his baby sister and two guys that can't seem to figure out how a Frisbee works. First up, Steven Lucchesi shared this adorable video of his son Elijah. Elijah is one heck of a big brother. Rather than harass his little sister, like big brothers are famous for, he lets her know how great she is doing, walking along with him on his toy four-wheeler. Properly throwing a Frisbee is a lot harder than it looks, but this is a bit ridiculous. In this video from Sparkinter82, two Bosnian gentlemen don't quite seem to understand the horizontal spinning technique required to float a flying disc. Remember: It's all in the wrist.